I said yesterday that the gods are not pleased with me this year, but they must not be entirely angry — Fleur de Liane is not my only chance for joy from perfumer Bertrand Duchaufour at L'Artisan this year. Next month also sees the launch of L'Artisan's new signature fragrance for the West Village perfume boutique Aedes de Venustas*, and this one is right up my alley. Of these ingredients, incense and leather stand out. The incense of Aedes' room fragrance is not burning or smoldering incense, but fresh, unburned incense that has a light, slightly powdery, near-vanilla aroma with hints of cedar and sandalwood. A mellow leather note is present throughout the fragrance’s development and is especially noticeable in the dry down if you spray this scent onto skin. Kevin is correct that the incense stands out, and right from the first spray. It mingles with citrus-y notes at first, later, briefly, with a very soft rose; the whole thing is laid over dark woody-leathery base notes. The Eau de Parfum is much deeper, and possibly a bit darker, than the room spray. It's also much darker than Duchaufour's incense for Amouage, Jubilation XXV; still, it doesn't have anything like the gloomy, high-church sort of atmosphere of his Avignon for Comme des Garçons. The leather is absolutely buttery-smooth, and the finish strikes me as more velvety than that of the room spray. It's beautifully spicy — the top notes are quite peppery — and a bit more so than the room spray. It is very much a cool weather scent to my nose, and I found it a bit too heavy when I first tried it in July. Today, it's still warm enough to wear shorts but the air is considerably cooler, and it's just perfect. The everlasting flower was more noticeable to me in the room spray; here, it's subtle at most. I was interested to see coffee in the fragrance notes (see below) but for the life of me I can't smell it. It certainly isn't as obvious as it is in Duchaufour's Kyoto (another Comme des Garçons fragrance). 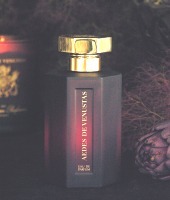 L'Artisan Parfumeur Aedes de Venustas will be available in 100 ml Eau de Parfum, and will be exclusive to Aedes. The notes feature orange oil, pink pepper, cardamom, incense essential oil, black pepper, rose, iris, cedarwood, incense resinoid, patchouli, coffee, opoponax, benzoin, treemoss, everlasting flower, white musk and vanilla. * Disclaimer: Aedes is currently an advertiser at Now Smell This. This sounds truly exciting! I have never tried the room spray, but I am a big fan of Duchaufour's incense creations. You said a bit about what fragrances it is not like–is it similar to anything else you've tried? Some nice person, I can't remember who, sent me a sample in the depths of this summer's heat. I dabbed some on, but it was just too heavy for the heat to fairly evaluate. But now that Fall is upon us, I need to whip that sucker out and dab away! I love Bertrand's fragrances, don't you, R? He is so talented and quickly becoming my favorite perfumer. Oh, this sounds glorious! Am slapping myself in the forehead that somehow I missed this at Aedes (the room spray). I should definitely try it. Actually, i might prefer the room spray; I love immortelle. This has become my holiest of grails – it s even more wonderful in reality than Robin's very astute description! It was truly love at first sniff for me – I first tried it on a very hot day and could not get it off my mind. It has an effervescent, almost gingery quality that had a purifying & cooling effect in the heat. And it took me all of 30 seconds to make the decision to buy it last Friday when I was in Aedes at lunch time! Yes, have tried it. II could be wrong but I think maybe Aedes is selling samples already? Might be worth emailing to check. R, don't know what the weather is like there now (and maybe don't want to know — I'll be jealous!) but it definitely needs a cooler day, IMHO. And yes, BD is really a genius. Oh thanks Robin! I will check it out and report back if/when I find out. Ok, now we're talking — I am going to have to dig my unsniffed sample of the room spray out of my drawer as soon as I get home. Definitely looking forward to this one, and if it's darker than Jubilation XXV without being churchy (and less expensive than Amouage to boot! ), this could be a great autumn. Thanks, R.! Yum, yum, yum! Love the room spray, thanx to you, and this one sounds just wonderful. God bless BD! I was lucky enough to try this, thanks to the sample a generous person sent me (thanks! ), and I have to say it was love at first sniff. It's dark, without the brooding quality of Avignon, and bright, without the fleeting quality of Passage d'Enfer. In fact, it's just what I wanted Serge Noire to be, but expected to be disappointed. (Actually, I liked Serge Noire, and would love it if that pesky cumin note wasn't there.) Why, oh why, don't Aedes ship abroad? I'd love to sample this one too! And love how perfectly the fragrance seems to fit with the color of the bottle and the whole feeling of the shop itself. I think you'll like it, L.
You do know about the Jubilation travel sizes on beautyenounter? I mean, you need this too, but that is a deal too good to pass up. I've had my eye on that travel size for a couple weeks now and have been sitting on my hands trying to avoid pulling out the credit card. And look, a link to Beauty Encounter just inches away from this comment box! Sigh. Serge Noire is nothing like I expected. I think I like it too, but not sure, and am still disconcerted by reading on Perfume Posse that it's very like Bond's Lexington Avenue, thinking March was nuts, then discovering she's spot on. It's definitely worth a shot for anyone who likes incense and/or (soft) leather. A, that's so true — it's just a perfect fit for Aedes. I have to tell you that I absolutely LOVE this store! Aedes De Venustas is a paradise for perfume lovers. Greatest location in NYC actually. Just off Christopher Street in the West Village and facing the famous intersection of Christopher Street and GAY Street! So many pictures of that street name have been taken and framed around the world! The staff at Aedes are the nicest people and the owner Karl, one of the most knowledgeable about perfume and a truly nice person who will stop at nothing to help a customer find their “true identity scent”. Karl has that nice and respectful demeanor of someone who really CARES about what you are looking for and not simply trying to make a sale. Each and every reader of this blog who is contemplating a visit to New York City should make the time to visit Aedes De Venustas! I cannot wait to go try this new scent. It sounds exquisite! I have tried the candle and loved it in the past. It just sounds like everything I love when it comes to fragrance notes. And the bottle looks absolutely beautiful. The best looking bottle of the entire L'Artisan parfumeur line must I say! “Samples will be available for shipping 10/1, with the official release date. We peons, who aren't perfume critics or live near the store, will just have to wait. Darn it! I have to say I was impressed with the speed of their response to my email. Thanks Aedes! Wow Kevin, you make it sound wonderful! I hope to someday make it to NYC. If I do, Aedes will be a must visit. Agree that the bottle looks beautiful…at least from the picture. I love the AG Mandragore purple bottle, and the color of this bottle looks gorgeous as well. Drat. Oh well, a few more weeks, right? Oops! I was thinking about Kevin when I wrote to Eric…so sorry. I really did see that Eric wrote the above…thanks Eric! WOW! This scent looks really nice! Seems like it's got everything I adore! So much for the buying restriction I'd given myself! I've got my eye on it too. Can't decide. Have spent too much this year. It's really hard to take a buying break, isn't it? It will be $185 for 100 ml, so more than the regular L'Artisan EdPs ($155), but not nearly so aspirationally priced as the vintage scents ($295). Good thing that store isn't in SF! I'd be in major trouble and over-budget! Unfortunately, that's a BAD way to make spending decisions (she's a “terrible” shopping companion), but it's what keeps running through my mind. I keep wondering how “limited” the “limited supply” is… Nice to know you're in the same boat (I think). I have not smelled the room spray, and I can't help but think of Essence of John Galliano by Diptyque (that Giacobetti did). Is AdV EdP at all like EoJG? Ack, I do wish they'd make that one into a scent too! This is much “thicker”, spicier (much), darker, less smoky. I adore the Galliano but it's a sort of “snapshot” scent to me (like a soundbite, you know? Luca Turin had a good word for these “little smell” kind of perfumes but forget what it is), very much in OG's style, this is more of a full-fledged perfume. HA — the men's is now “temporarily unavailable”. They still have the women's. For now. You will laugh at me and not be surprised: I immediately had to seek out that 1oz bottle at another site and buy it, because it really is too great of a value to pass up. Sorry I couldn't do that through one of your sponsors! I'm done (I said I'm done!) for September! Where did you find it??? Maybe you should tell me. But do. And for heaven's sakes, don't worry about it not being through one of my sponsors, always buy where it's cheapest! Haha, ok… I bought it at perfumeshop.com, but I also saw it on Amazon marketplace. Go get your credit card!